Jim: Well, Mr. Mike, we find ourselves together again. Jim: And, we all can seem to find ourselves at the same stream, do we not? Jim: The same stream of life. Jim: How do we keep running into each other? Mike: It’s like it’s on a calendar or something. Jim: It seems like it’s like serendipity. Or, with you and I it’s more like synchronicity where we’re 1+1 = more than 2. Mike: We end up here so often in front of these microphones, and said hey, let’s go fishing without bait. Jim: Yes. 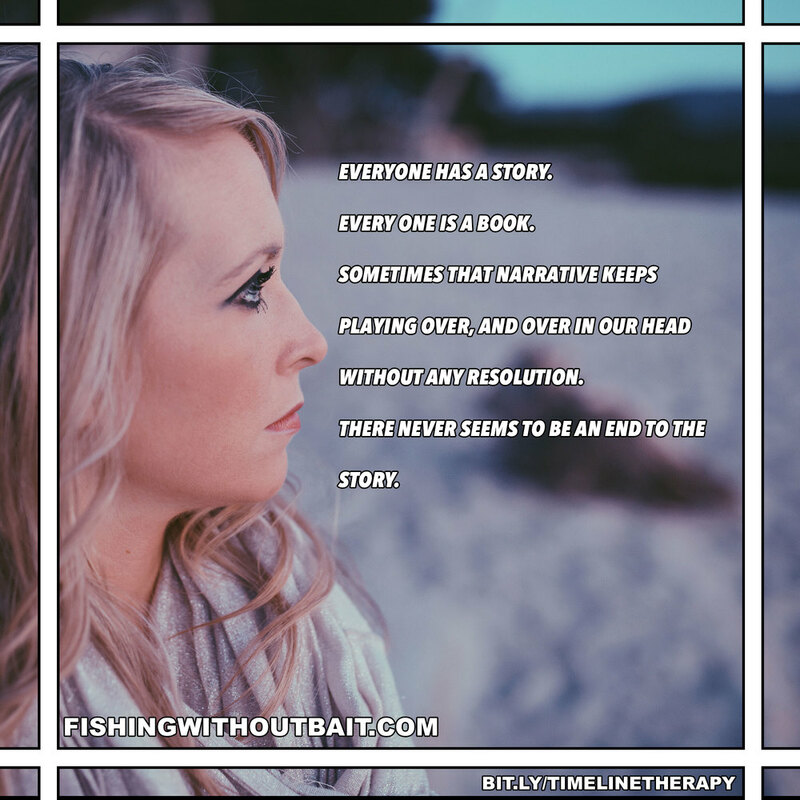 And, quite often when we do go fishing and we walk away without anything we’re just as happy or are happier than when we began. How can that work? How can that be possible? Mike: Could it be magic, Jim? Jim: It could be. It could be magic. Or perhaps it could be mindfulness. Jim: It could be passively living life without definitive expectations. Mike: That sounds like a grand idea. Jim: Indeed it is. And, again, that’s the whole concept of our podcast, is it not? Jim: So, Mike, quite often we talk about time traveling, do we not? Mike: That’s right! But, not the Doc Brown kind. Jim: So, we talk about time traveling, and we talk about past and present, we talk about the future. However, every single human being is a product of their past, are they not? Unless you’ve hatched within the past couple minutes. Mike: Then you have a whole other batch of problems. Jim: Then you’ll be on the 11:00 news. However, what our concept is is that it’s our past that has propelled you to your present. And, of course, we always want to stay in the present because this is exactly when life is happening. However, our self-concept, our self-esteem, our identity – they live in our storyline, do they not? They live in our past. Our emotional responses to previous life events consciously – or subconsciously can be a lens that filters perceptions that impact our life in the present. That sounds like a whole lot of words doesn’t it? Mike: That’s a lot. I’m wrapping my head around that. I’m traveling back in time to take that in again. Jim: So, when we’re – let’s say when we’re, we have behaviors. We have behaviors in the present. So, do we treat behaviors as merely, like a gaping wound, or a sunburn, or a cut? Or do we look to see what drives behaviors? To look at what drives behaviors, quite often we need to examine the past and bring the past into the present. So, what we want to do is we want to talk about a narrative in our lives. Everyone has a narrative in their life, right? Mike: Everybody’s got a story. We could all write a book. Jim: Everyone has a story. And, every one is a book. However, sometimes because of that past – because of that narrative, that narrative keeps playing over, and over, and over, and over in our head without any resolution. There never seems to be an end to the story. How many people do you meet that talk about racing thoughts? Jim: Or they can’t sleep at night. Jim: Or they wake up in the middle of the night and they can’t get back to sleep. Jim: So, what we try to do is – and what I’m going to introduce tonight is a bit of self-examination in the present moment. And, what we’re going to talk a little bit about is creating a timeline – creating a timeline of our life and see how we connect with people, places, things, circumstances, and events that are in our life. And, again, I would suggest that we do not attempt this until we become a bit more stable in our mindfulness and can sit back and become the observer of these people, places, things, circumstances, and events rather than relive and reparticipate. Mike: I think that’s a moment you hit on there that we do need to kind of reiterate a little bit. A lot of what we talk about here, a lot of people are looking for resolutions now. And, we’ve been talking about resolutions for 23 episodes now, here. And, I don’t know where you are along this journey. Maybe you have another 23 ahead of you depending on when you found this podcast. And, it’s not a thing that’s going to be tomorrow. It’s a thing that’s going to take every day. You can’t lose that 20 pounds tomorrow. It’s going to take time to keep working at it and keep working on your body. And, the same thing happens with your mind and your emotions. Jim: Well said. If you and I want to – let’s say I want to bench press 300 pounds. And, if I go to the gym tomorrow, and if I put 300 pounds on the bench press, I’m not going to be able to do it. Mike: And, you’re probably going to the hospital. Jim: And, I’m going to be setting myself up for disappointment, am I not? Jim: So, let’s say I get angry, and I get really determined. However, the next day I go back, and what do I do? I put 300 pounds again on the bar. And again, I leave frustrated and angry and depressed. So, what we’re talking about is through these mindfulness exercises is to build ourselves up to a point of stability – to build ourselves up to a point of being the observer behind the thinker, being a non-judgmental observer. We’ve quite often talked about going to the movies – sitting in that theater, watching the film, watching these people, places, things, circumstances, and events play out and being really able to label and describe situations and events. Because what we do remember – this is where our self-concept, this is where our identity formation began. In our storyline, and how we emotionally responded to those events play out again as if we respond out today. So, what we want to do, Mike, is non-judgmentally – with the help of probably a trained person, we put particular markers along these lines. Specific events that perhaps add some significance. And, what we try to do – remember, we try to judge these things significant to us. Would someone else consider this significant? That’s not a consideration. Mike: It’s very perceptive. I mean, the perception is the world is flat when really you’re part of a large universe of a bunch of planets bumping into each other. Your perception is everything happening around you and not what’s happening behind all of those things you’re experiencing. Jim: And, what we want to do is when we have this done – and it takes some time, we want to be able to recognize areas where we experienced happiness and/or success or at times the opposite. Remember when we had failure. Remember when we had sadness and grief. Again, we want to recognize these areas, and again, why do we continually stress the importance of being accurately able to label and describe non-judgementally – label and describe. It gives us control. And, it gives us some power over that. So, we have to remember that how we process those emotions, and how we process those emotions today have a direct impact on our reaction to real life events – to real time events – to present moment events. Let’s say that you were traumatized when you were young. The only place that you were ever felt safe was locked in your room. Is it unusual that a person like that would think that the only place that’s safe now would be to alienate themselves from other people? And to isolate and be alone? That’s the only place they were ever safe. Mike: It’s all they know. That is their world. Jim: And, that’s the filter. That’s our perception filter. We build a perceptions filter and what we do here with Fishing Without Bait and through the mindfulness. So, what we being to do, Mike, is we work on identifying in the past those markers that began this type of behavior and again we get back to choice and choosing and when we begin to choose to let go of those events’ power that define us. And, what we begin, Mike, is begin to take ownership of our past. And, rather than letting it define us, we define it. How often do we let other people, places, things, circumstances, and events define us – rather than us defining that. Mike: I’m a person that this thing happened to, rather than I’m a person that does this. Jim: Absolutely. You have that correctly. Well said. You’re right on top of it tonight, Mike. Mike: You haven’t listened to my other podcast. Jim: Taking ownership of your past, your narrative – it is your story, no one else’s. What this involves is a concept of making conscious choices. So, what is conscious choices? Being present and aware – being in the moment, having conscious awareness of being able to accurately describe, paying attention on purpose to what’s right in front of you. And, again, when we talk about neuroplasticity this is how we reform neural networks. We reform them. We begin to remap your mind. And, again, what’s the simplest definition of neuroplasticity? Teaching an old dog new tricks. And, again, what we do is we take time to reflect, which is again the awareness aspect of it, in the moments in our lives. So, what we want to do is begin to plot out a timeline. Begin to plot out some areas in your life. And, this is an introductory – I guess in the trade this would be called a teaser type of podcast, where we again introduce. We’re introducing this concept and our previous 22 podcasts have begun to teach us perhaps a little bit about the exercises that we have so we can actually put into play some of these skills that maybe we’ve learned – and we’ll talk about those, and how to deal with the automatic negative thoughts. The low self-esteem. The low self-concept. Some of the things that perhaps we’re dealing with in the present time today. So, I think this is pretty exciting – pretty exciting material. Mike: I can’t wait to take the deep dive in this. Jim: We’re going all the way. We’re jumping into the deep end of the pool. However, keep in mind we have to learn how to swim before we can do that. And, always have a swim buddy with you. And a lifeline to shore. Mike: Am I your swim buddy? Is that what’s happening here? Jim: Indeed you are. So, until then, I’m asking you to show a kindness for another and please show a kindness to yourself. Thank you so much.